You'll like this if: you love steampunk, are a history/biology geek, love novels such as Oppel's Airbourne, Reeve's Mortal Engines series, Clare's Mortal Instruments series, and, of course, Westerfeld's Uglies trilogy (which is actually more of a saga than a trilogy). It's no secret that I love steampunk. All you have to do is take one look at the design for this website and you know that! So imagine my delight at finding out that Scott Westerfeld (of Uglies fame) was writing a steampunk novel! Patiently I waited for the books release, until I could bare it no longer and asked (ney begged) Simon and Schuster to rush me an ARC. Needless to say, I furiously ripped open the little yellow package it came in the minute I found it in my mailbox. That was a bit over a month ago. I've read it three times since. After having devoured the 440 pages of the novel not once but trice, I think it's safe to say this book did not disappoint! Read below to find out why! It is the cusp of World War I, and all the European powers are arming up. 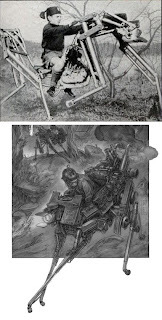 The Austro-Hungarians and Germans have their Clankers,steam-driven iron machines loaded with guns and ammunition. The British Darwinists employ fabricated animals as their weaponry. Their Leviathan is a whale airship, and the most masterful beast in the British fleet. Aleksandar Ferdinand, prince of the Austro-Hungarian Empire, is on the run. His own people have turned on him. His title is worthless. All he has is a battle-torn Stormwalker and a loyal crew of men. Deryn Sharp is a commoner, a girl disguised as a boy in the British Air Service. She's a brilliant airman. But her secret is in constant danger of being discovered.With the Great War brewing, Alek's and Deryn's paths cross in the most unexpected way...taking them both aboard the Leviathan on a fantastical, around-the-world adventure. One that will change both their lives forever. Book Trailer: Click here to watch! This creative reworking of history is not only clever, but wonderfully suspenseful. Leviathan mixes both reality and fantasy without being overbearing. You don't have to be a history buff to love this novel! Mr. Westerfeld weaves Deryn and Alek's lives so skillfully that their eventual meeting is completely seamless. The novel also hosts a wide cast of secondary (yet dimensional) characters that add color to Leviathan. Moreover, this book entertains a variety of dichotomies ranging from mechanical technology v. biological advancement to female v. male protagonists, which only add to the engaging nature of the novel rather than distract the reader from the story. Allow me to get this out of the way... 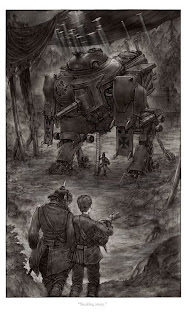 I LOVE THAT THIS NOVEL IS ILLUSTRATED! 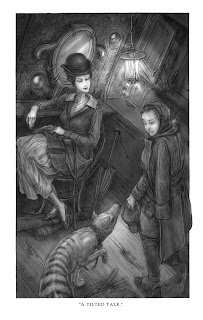 Keith Thompson is such a wonderful and talented illustrator. I really hope he continues to feature his work in other published novels. Favorite drawing in Leviathan? 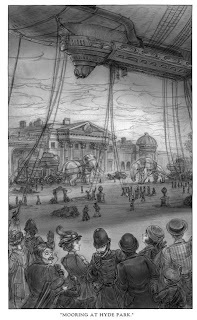 What's remarkable about this drawing is not only the airship, but also what's going on in the foreground. The pickpocket. The police. The man with the eyeglass. As a 19th-20th century aficionado, this illustration in particular plays true to the era. Love Alek and his comrades, likewise for Deryn. Adore all the land and air battles and the sudden appearance of the Kraken! I want to see more of you, Kraken! In the entire novel, there was only one scene that really irked me. You will find it below. "Deryn pulled the command whistle from her pocket. The freezing metal burned her lips as she piped a quick sequence, the notes of an intruder alert ringing in the cold air." I love Deryn. Truly, I do. However, this little section really irritated me. While I understand that she is very loyal to the Leviathan, I truly couldn't stand it when she wouldn't let Alek go. Filled to the brim with air and land battles, political dissidence, bravery, danger and reckless (albeit lively) abandon, Leviathan is one of the best, if not the best, of Westerfeld's novels. It's lavish illustrations and engaging storyline are equally entertaining for boys and girls, adults and teens alike. Looking forward to book two in the series! P.S. 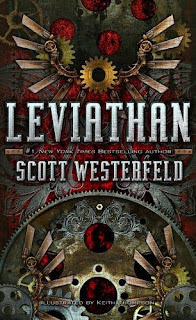 In case you've missed Scott Westerfeld's tour, a little birdie told me that the Leviathan series will not be a trilogy, but rather a series as S&S plans on printing a detailed illustrated companion to be released in conjunction with the third novel! Rejoice airship and clanker fanatics! I'm half way through Leviathan right now. It is so good! I love Deryn as well and when she almost got caught because of the shaving thing my heart beat double time for her!! I loved the book and can't wait to read the second one! I love Deryn! She is so cool, and Alek is a wonderful character as well. I just couldn't wait until the two met. I found it in a bookstore one Monday and didn't have the funds to purchase it immediately and resorted to spending every spare hour I had on Scott Westerfeld's website where I read and read over the little sneak-peek chapter. I was addicted before I even got the book. That Friday, I bought it. I had it finished by Monday. It's my favourite book ever, and it seems absolutely CRUELTY that the sequel doesn't come out until October 2010.